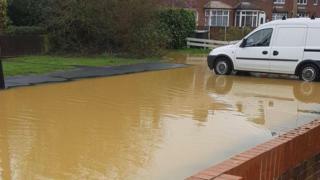 Homes have been flooded in a residential road by a burst water pipe. Cressing Road in Braintree, Essex, has been covered by water, after a pipe cracked further into town. Anglian Water, which has apologised for the inconvenience, said it will pay for any damage caused and said it was trying to get things "back to normal" as soon as possible. Repairs to the road, which residents say has collapsed, could take up to 10 days, the utility firm said. Resident Peter Cherry said several properties had been flooded, which had been exacerbated by cars driving through the water causing waves to hit homes. He said: "It has been a bit of a nightmare. "At about 08:40 GMT there was a burst pipe up the road towards the town centre. Quite quickly, in about 10 minutes, the road was completely flooded pretty much as far as you can see." A spokesman for Anglian Water said: "A team was quickly on site and ensured that homes had their water restored almost immediately, but unfortunately a small number of nearby homes have been flooded. "We're really sorry for any inconvenience this has caused, our teams are already on site helping the residents that have been affected and a clean up is under way. "We know how upsetting flooding can be and we'll foot the bill for any damage caused and work to get things back to normal as quickly as possible."